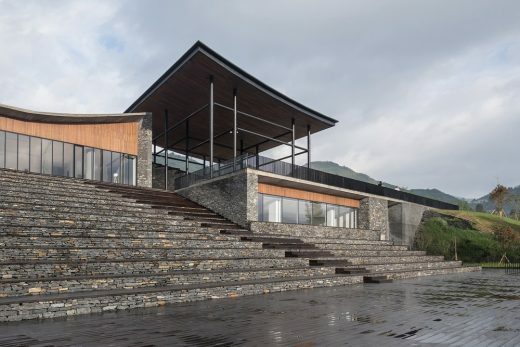 Located in the remote village of Tuanjie, the Dafa Canal Tourist Information Center is one of the first projects of a new government policy to help ameliorate rural poverty through the introduction of agricultural tourism. 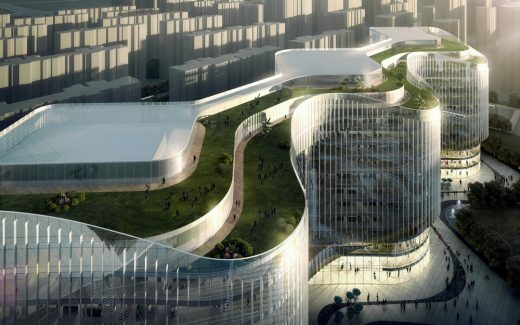 The building aims to become a new centerpiece in the village, catalyzing further development in the area. Recent years have seen hurried attempts by architects to preserve the disappearing traditional architecture in rural China. 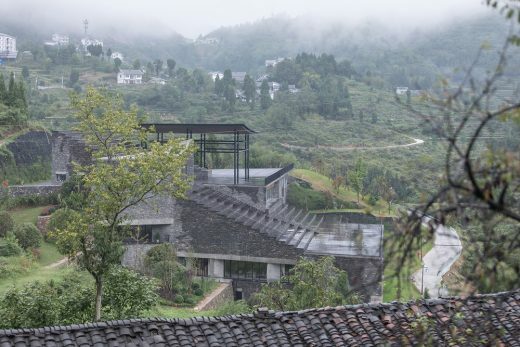 However, unlike other rural areas Tuanjie village has little traditional architecture to hold on to. Instead, its striking landscapes provide a new inspiration for a rural architecture that blurs the boundary between building and nature. 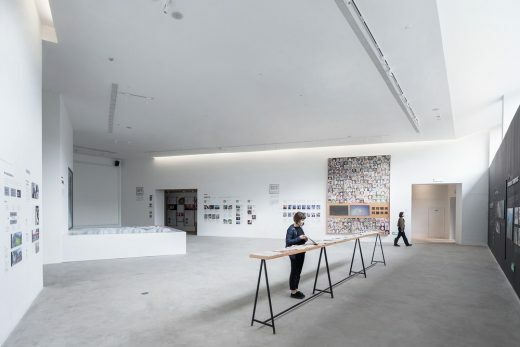 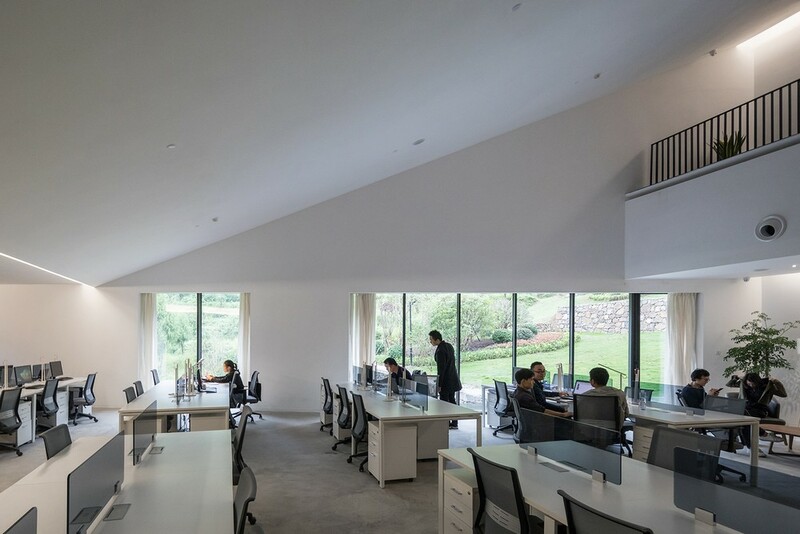 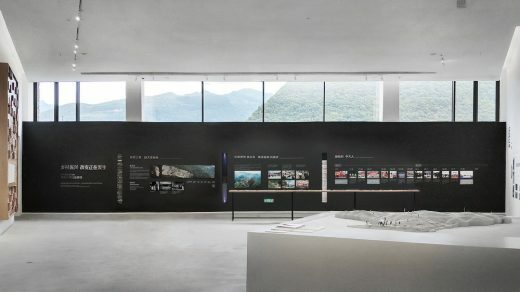 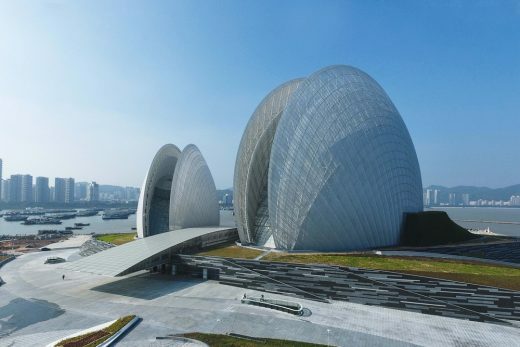 Dafa Canal Tourist Information Center combines office and exhibition program under a stepped public roof that merges into the surrounding landscape, serving as a new platform for local public life. 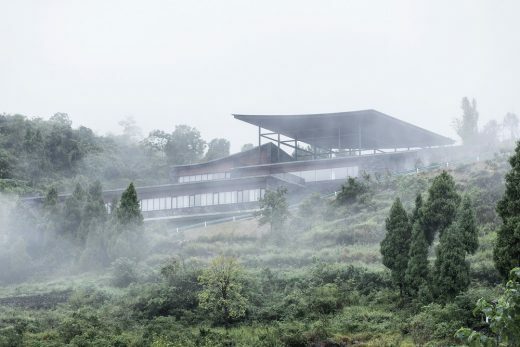 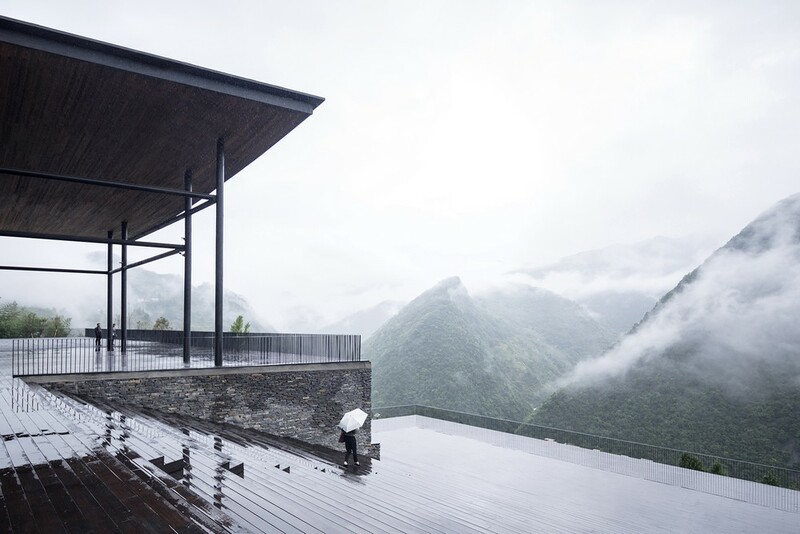 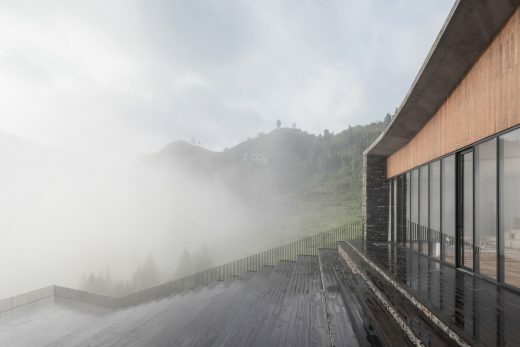 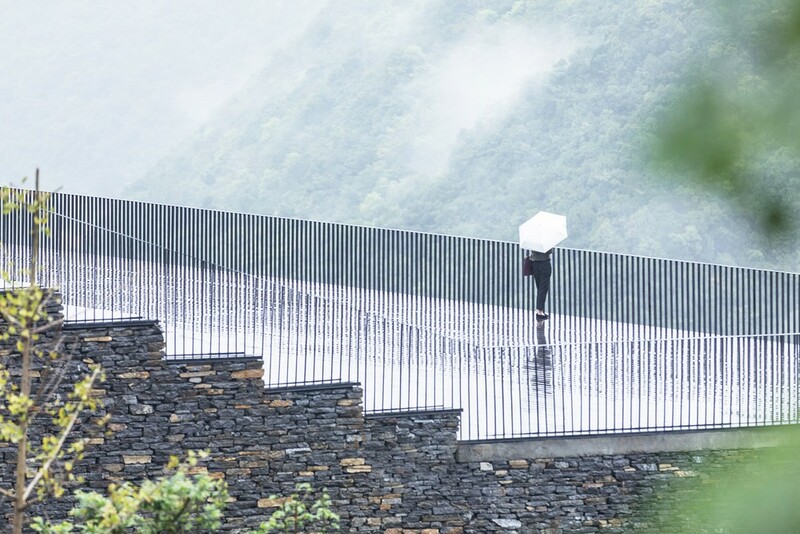 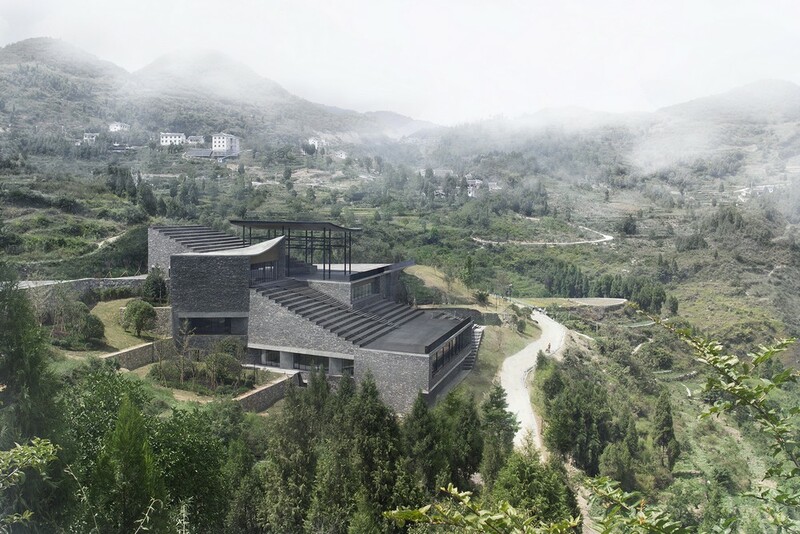 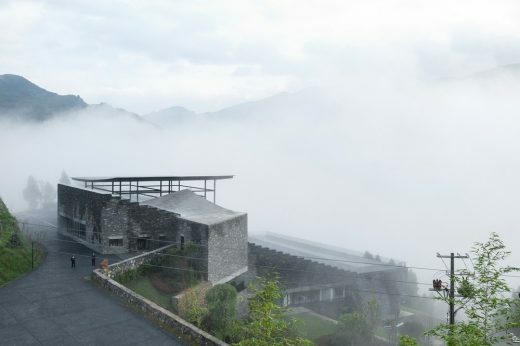 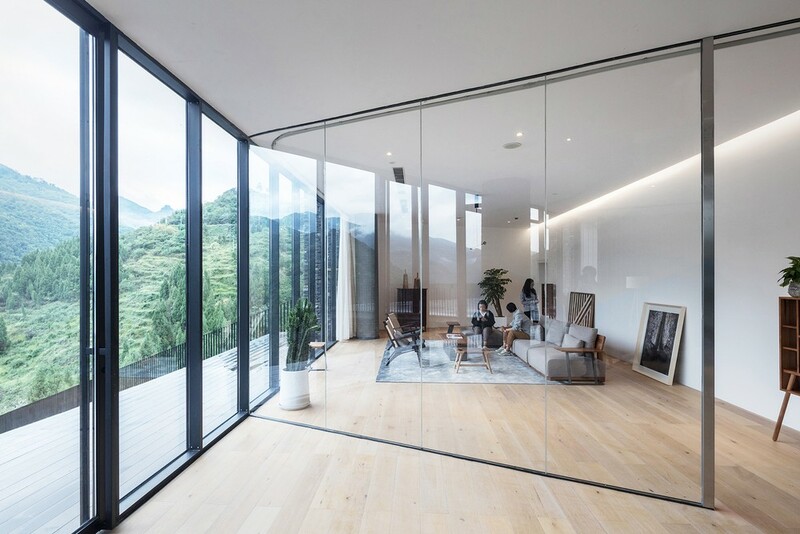 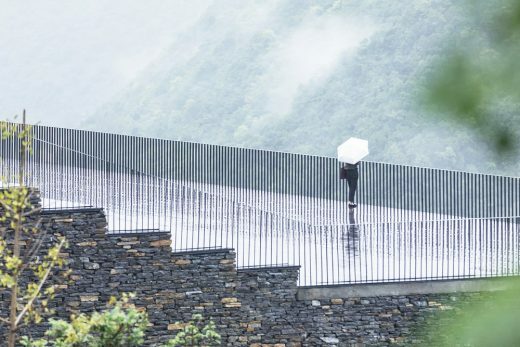 Nestled amongst the steep mountain surroundings, the building is set on a natural platform with a 10 meter elevation difference and beautiful views of the nearby river and mountains. The stepped form is born out of the linked constraints of site, access and views. 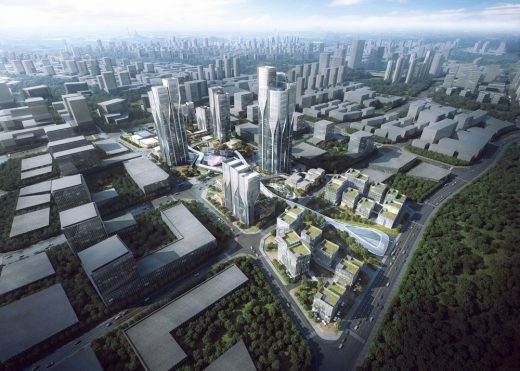 In addition, the concurrent construction of the site road and a strict project schedule enforced a rigorous approach to the project development. 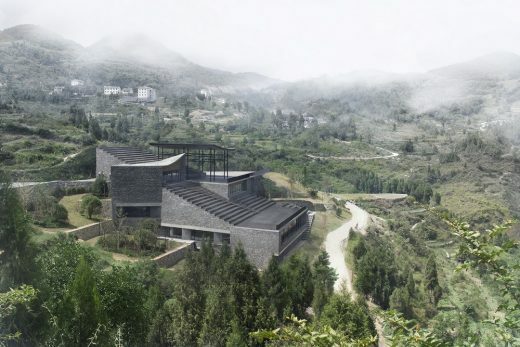 In the end, the constraints which shape the project form the distinctive characteristics of the tourist center. 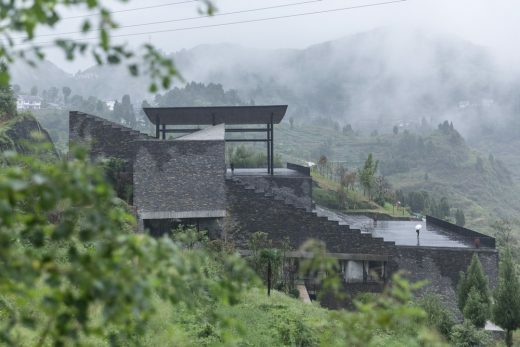 Many of the contemporary village buildings nearby were quickly built and are not fitting with the landscape in shape or concept. The tourist center suggests a different approach for village development which celebrates and elevates context through building. The stepped façade clad in local stone emerges directly from the landscape in both form and material, humanizing the scale of the building and working directly with the topography of the site. 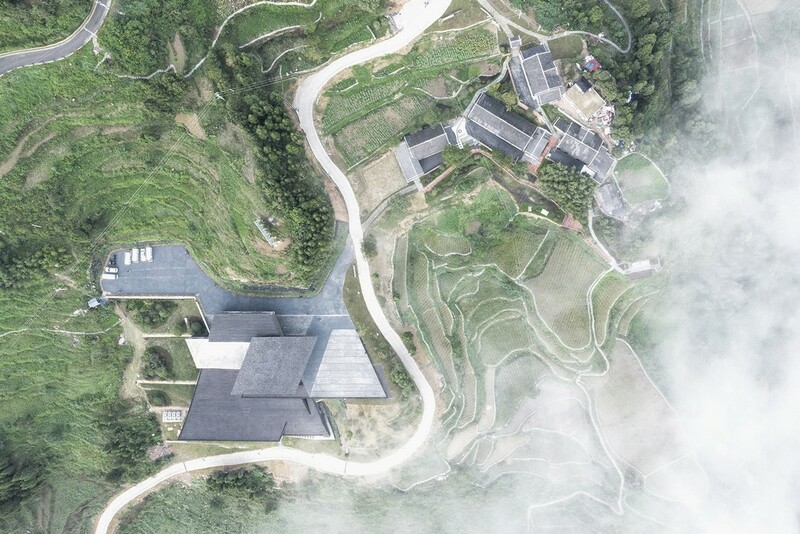 When viewed from below, the building reads as a composition of smaller volumes, harmonizing with the surrounding nature and village. 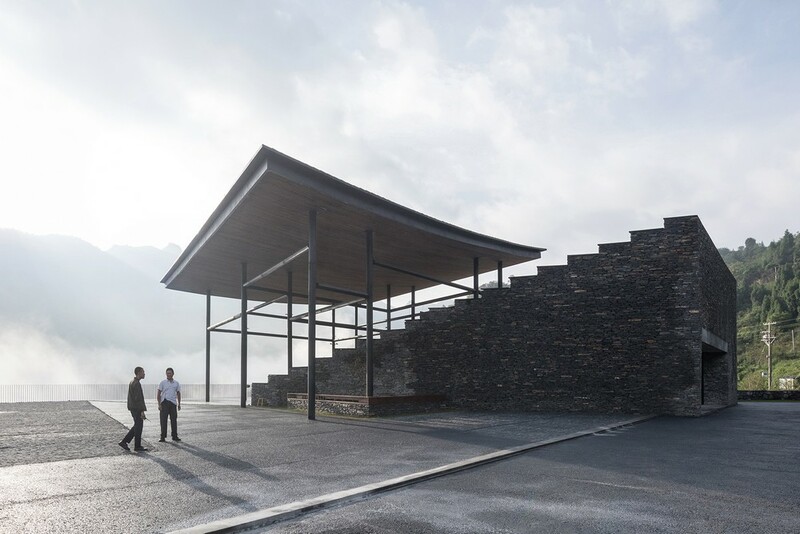 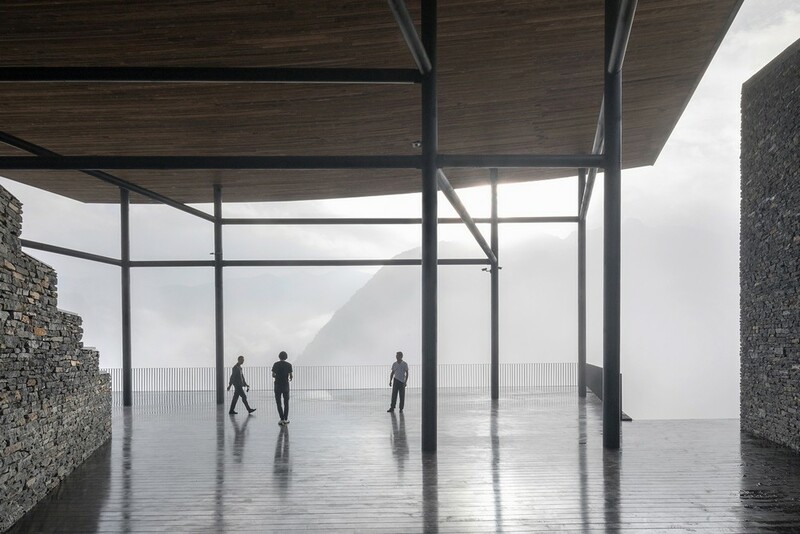 The steps becomes a stage for the public with a background of mountains, clouds and trees. 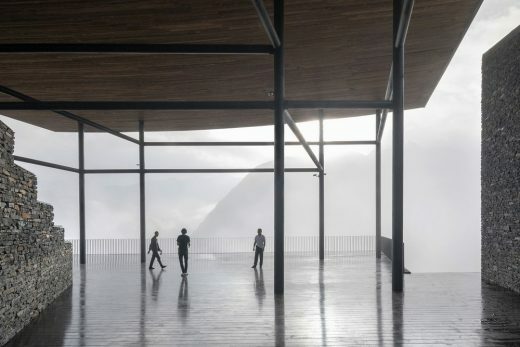 A floating canopy of wood tiles connects the entrance plaza and lobby with a semi-outdoor space that encourages people to linger. The interior spaces are stepped, responding to the hilly site with framed views of the mountain landscape introduced in each space. 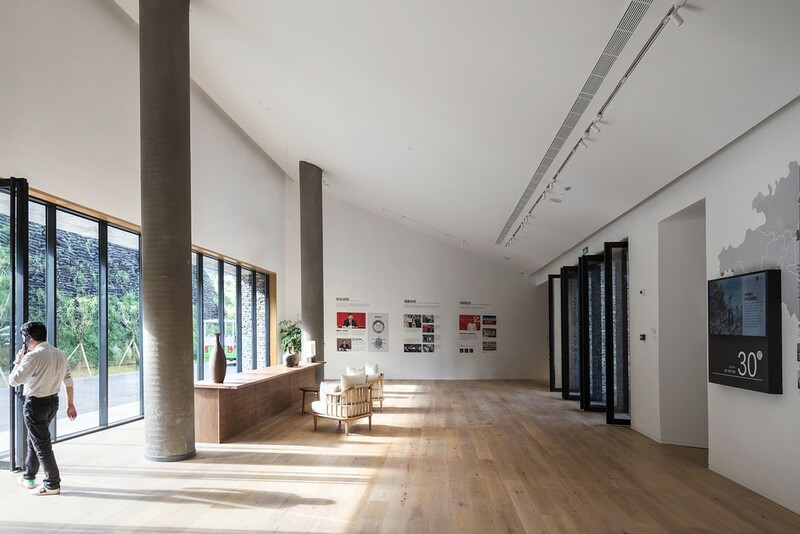 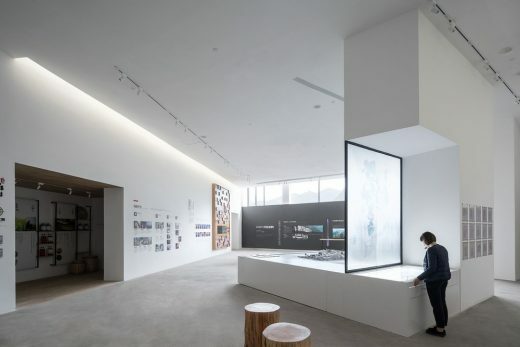 The interior design is simple and serene, putting focus on the exhibition and surrounding nature. 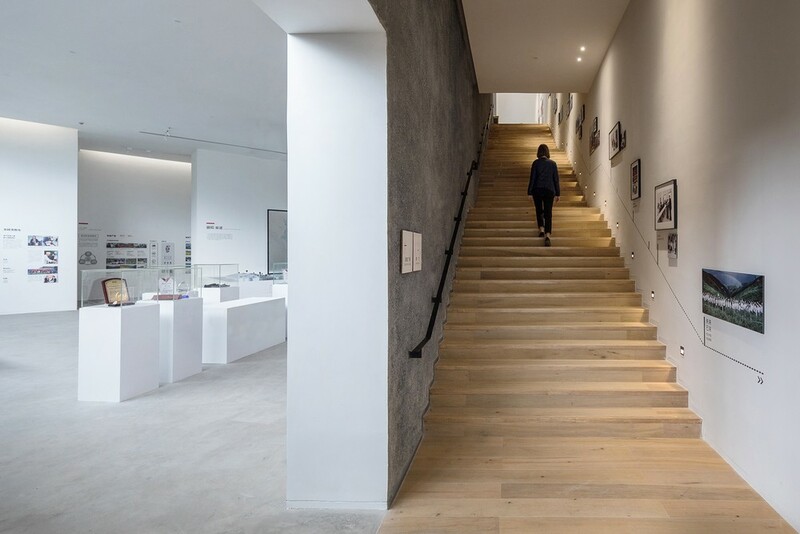 Two stairs link the different levels. 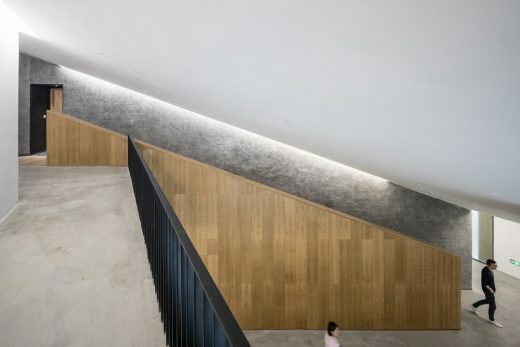 One connects meeting and office facilities and the other serves as a gallery stair, forming a continuous exhibition space that leads visitors to an outdoor public terrace. Positive changes in the village have already begun to appear, and with Dafa Canal Tourist Information Center as a catalyst, more possibilities and changes will soon be seen.